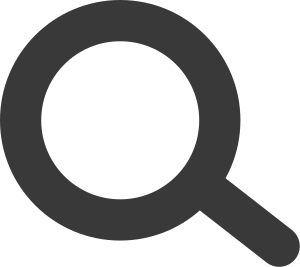 In classical Greek art, the winged goddess of victory, 'Nike', personifies the vistorious outcome of a struggle and is traditionally chosen to represent vistory at the Games. A magnificent example of this is 'The Nike of Paionos', sculpted in marble by Paionios from Mende between 425 - 421 B.C. The victory goddess is depicted in flight with her wings outstretched and the wind billowing against her tunic and himation as she gracefully descends from the sky. 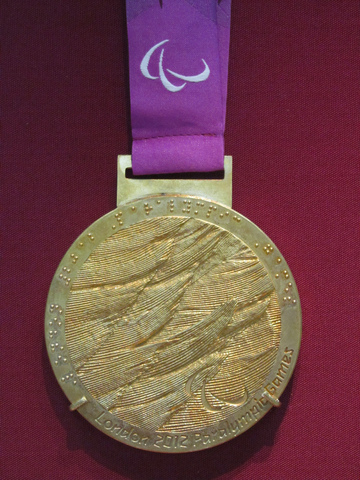 The obverse side of the medal represents 'Spirit in motion' and depicts a close up of the outstretched imagined wings of the victory goddess, providing inspiration and a natural metaphor for the ethos fo the Paralympic Games. The reverse of the medal represents 'The heart of victory' and is a close up of an area close to the heart of the goddess. 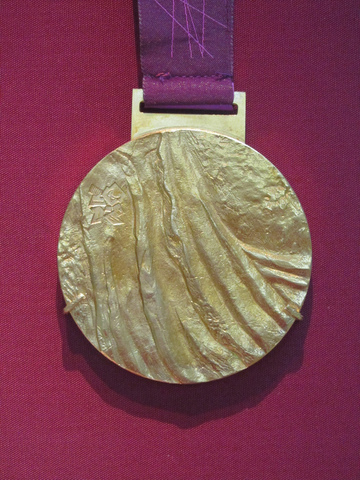 It is symbolically chosen to reflect inclusion and togetherness at an historical event and the reverse is overlaid with textural qualities moulded directly from the Plaster Cast of 'the Nike of Paionios' residing in the British Museum Cast Collection in Olympia, West Kensington. 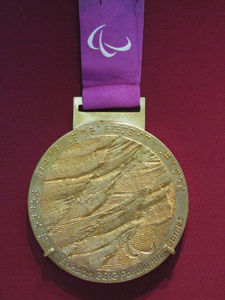 Work consists of one design; approximately 2100 medals produced.